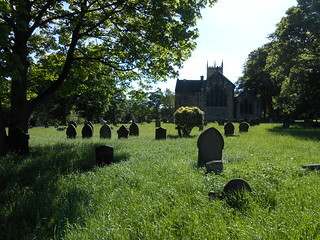 I’m in Swinton to look for the burial plot of Peter (1873) and Mary (1870) Robertson in St. Margaret’s church. 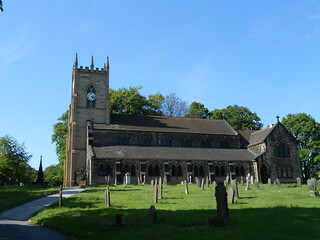 St Margaret’s Church is a large parish church, suggesting the town was wealthy when it was last built, following a fire, in 1899. The walls of the church are puritanically plain with a simple wall hanging between each window marking the stations of the cross, from the passion. I associate the 14 stations of the cross with Catholicism. Some gravestones mark burials as early as 1843. 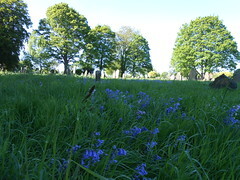 The earlier graves are closer to the church. Many of the grave markers are missing. Once there would have been neat rows of east-west facing stones. It looks like nearly half of the stones in this early part of the graveyard have gone. Fallen. When I asked the Verger about the missing stones she said it was due to ‘Subsidence’, quite literally fallen. There are no maps of the burial plot, she doesn’t know of any records. I suspect they were lost in the fire of 1897, I’ll ask the vicar. I’d emailed the Vicar 2 weeks before visiting, he hadn’t acknowledged receiving my email. He must be a very busy man. Two hours carefully uncovering, reading, the names on all the headstones in the older part of the graveyard, I regret not having phoned the Vicar before I visited. While I search the graveyard children run through, it’s a through-route to the local park. Elderly people carry shopping through the graveyard, it’s a through route between social housing bungalows and the main shopping high street. This place is alive with people. Most passers-by say hello and comment on the lovely weather. The Verger explained that the Vicar is very busy. The Verger looks busy. She is here. The Vicar only answers the phone in his office, in the church, but he’s rarely there. I wonder what keeps the vicar so busy away from the home of his congregation. 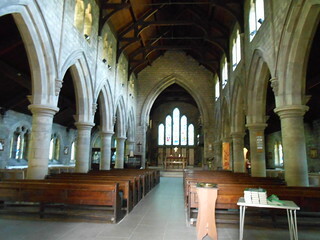 The Verger suggests that I visit the church on a Monday night between 6.30 and 7pm, that’s when the Vicar comes to meet the public and deal with things like arranging weddings. But not this Monday because he’s very busy with Whitsun. Again, I wonder how this vicar spends his time caring for his living flock. Alas, I didn’t find Peter (1873) and Mary (1870) Robertson’s burial plot. I did spend a very pleasant afternoon looking. This scribble was published on Tuesday, May 28th, 2013. You can follow any banter on this scribble with the RSS 2.0 feed. You can share your inspired musings after typing the anti spam word near the bottom of the page. But no Pinging because its too naughty.